Yesterday, I finally watched volume 2 of Kill Bill. The first part was great in my opinion, and the second part is nice, but not great. In fact, the only reason to see it is to finally witness how Bill is being Killed. 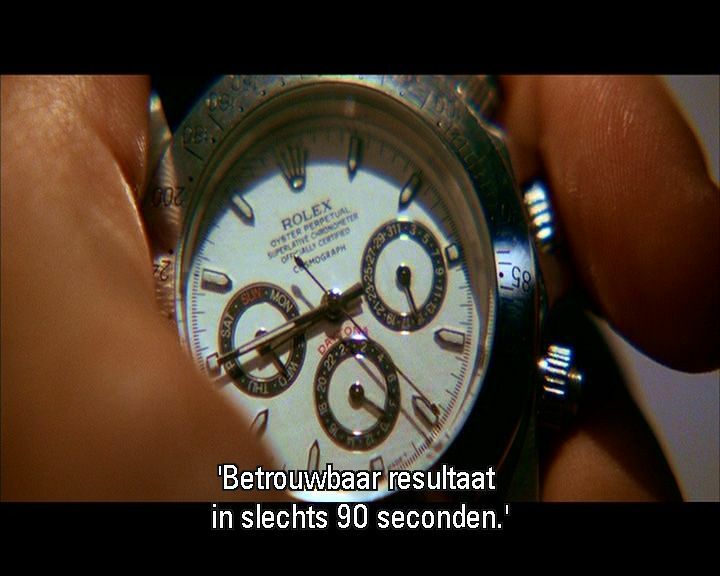 Anyway (to keep it on-topic), in part two I noticed this Rolex Daytona she (Uma Thurman) uses to check her predictor-stick. At first I thought it was cool that she has such a nice masculine watch. Later on, when I examined the still images on my PC, it was clearly a fake Daytona. What a bummer.